Dead Love: Teens Love Dead Love! The whole gruesome DL cast is gut-wrenchingly gleeful about 17-year-old Stephanie Barnett’s Dead Love review in Kings River Life. A fresh, young brain always works best! We are tired of listening to the mumbling and grumbling of musty old critics who can’t even follow the storyline and clearly don’t have much respect for girrrrrls, dead or alive. Isn’t that the novel’s point? Stephanie gets it, and she gets our vote for smart reader, savvy critic. Stephanie Barnett is 17 and a contributor to our Teen Talk section. She is a senior at Reedley High School who plans to attend Fresno State next fall and become a music teacher. At RHS she is in band, drama & an officer in NJROTC. Comment and enter the Dead Love Giveaway here. What a terrific condensation of the story line. Makes me want to read it again! 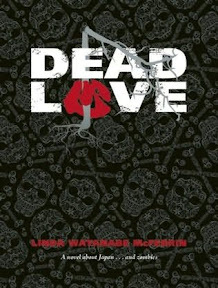 What a fabulous review of Dead Love. There’s hope out there in reader land after all. Must be a nice shot in the arm, Erin, to have a reader who gets your story and understands you. I’m sure there are hundreds like Stephanie out there, may the Slice reach them all! Now I’m going to read Dead Love again!